Leeks look like scallions on steroids, and like scallions, they are usually sold in bunches, generally about four leeks to a bunch. Hopefully, your market sells them unpackaged with the roots and dark green leaves intact, which gives them a longer life. Packaging in plastic promotes rot. Leeks are available year-round in most markets, but prime time is from September through the end of April. Select leeks with a clean white slender bulb, at least two to three inches of white, and firm, tightly-rolled dark green tops. The base should be at least 1/2 inch in diameter, although most are much larger, usually 1 and 1/2 to 2 and 1/2 inches. The younger the leek, the more delicate the flavor and texture. Look for the slim, cylindrical ones rather than those that are large and bulbous. If the bottoms are beginning to round into bulb shapes, the leeks are a bit too mature. Check the center of the leek for a seed stalk (the hard stalk can sometimes be felt with a gentle squeeze) and avoid any you find. Those with a seed stalk beginning will have a tough, woody center. If the leek is limp at all, pass it up. Leeks will exude an aroma that can be absorbed by other things in your refrigerator, so to store them before cooking, lightly wrap them in plastic wrap to contain the odor and moisture. Do not trim or wash before storing. Store in the vegetable drawer of your refrigerator. Depending on the freshness factor when you buy them, leeks can be stored anywhere from five days up to two weeks. Cooked leeks should be covered, refrigerated, and used within one to two days. Leeks are unfortunately not a good candidate for freezing or canning unless you plan on using them in soups or other recipes rather than as a main dish. Freezing tends to turn them to mush and lends a bitter taste. 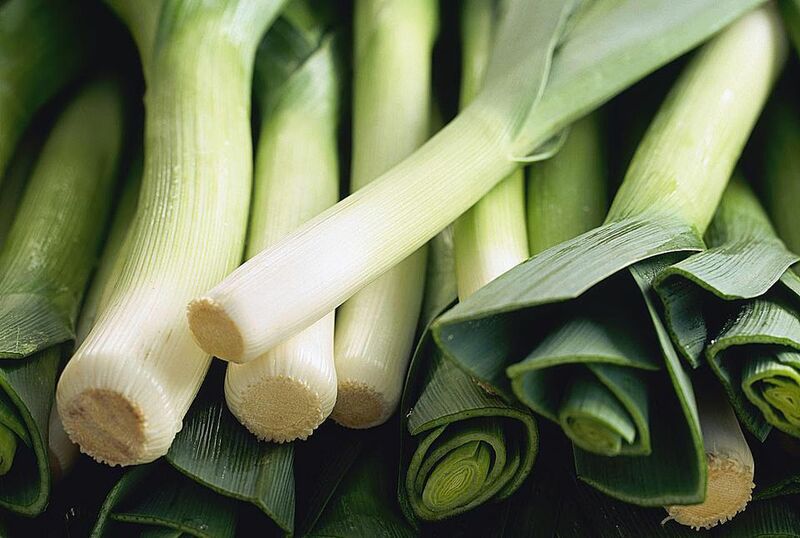 If you decide to freeze leeks, cut into slices or whole lengths. Seal in airtight bags, freeze, and use within three months. To preserve flavor, do not thaw before cooking further. Use frozen cooked leftovers for soup within three months.